A report released today reveals that moving to a publicly owned energy system in the UK would pay for itself in 10 years. Savings of £3.2 billion per year would be possible because no shareholder dividends would be paid out and the cost of capital would be lower. The research challenges a previous assertion by stockbroking firm Jefferies that the cost could be as high as £185 billion. It estimates that the cost of compensating shareholders would cost between £24 billion and £36.6 billion (a final price of £32 billion would take 10 years to pay back). The report proposes a new model of public ownership based on a combination of national, regional and local public ownership. The proposal is affordable and practical under existing EU law. The model would encourage renewable energy generation by local authority providers, co-operatives and community groups. There would be a public purchase of some generating capacity, the National Grid and energy distribution. The Big Six energy supply companies who currently have 95% of the supply market would not be bought (as Jefferies assumed). Instead, new local public sector companies would be created who would compete with the Big Six to supply consumers. In Germany such companies have captured up to 50% of the market. "The paper takes a hard look at the costs and benefits of public ownership of the energy sector, and the practical issues of how to get there - what needs to be bought and what doesn't, how transparent local ownership can work. The benefits are much greater than usually imagined, and the costs are much lower than previously assumed." "We welcome this report. At the moment, the process for setting up energy companies is long and complex and completely geared towards the private sector. We are the first local authority to launch our own company aimed at bringing cheaper prices to consumers by cutting out the profit motive of the Big Six." “People are sick and tired of being ripped off by profiteering energy companies. The Big Six have forced up prices, pocketed billions in profit and continue to invest in dirty energy. This report demonstrates this no longer needs to be the case and supports our campaign for a people’s alternative in London. A London public energy company could decrease bills by 25% and invest enough in solar energy to power a fifth of London’s electricity. What’s more, 78% of Londoners want this. We’re calling on the Greater London Authority to set up a democratic, affordable and clean energy company that is controlled by ordinary Londoners, not cash-hungry business executives." Under the new model, after ten years, the ongoing savings from public ownership could be converted into price cuts of 10% or reinvested in renewables. The refinancing of private debt would mean further savings over time of £0.7 billion a year - equivalent to a further price cut for households of £25 a year. 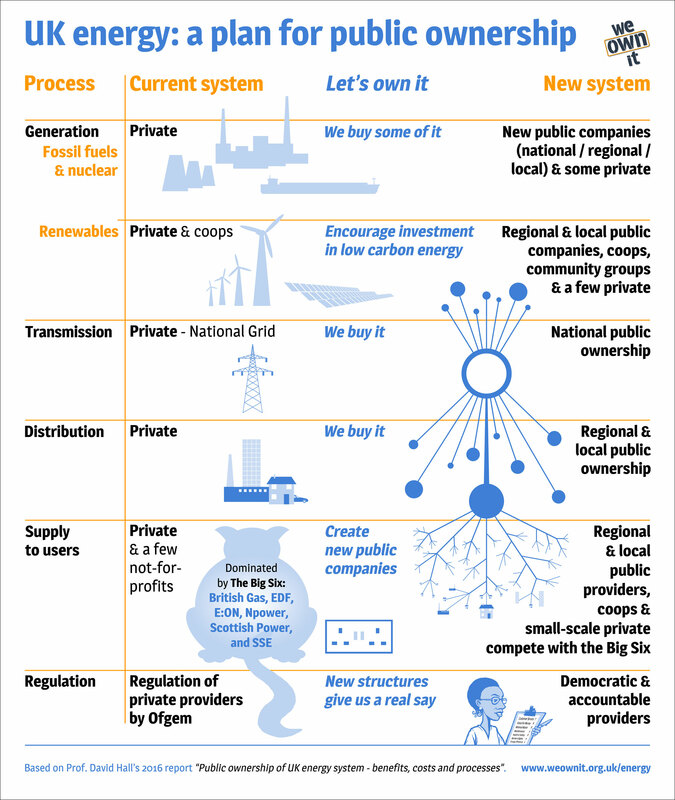 Public ownership of energy is increasingly common around the world. The report points out that 48 million Americans, in over 2000 cities and districts, get their electricity from the public sector, at a price on average 12% lower than the price charged by private energy companies. It's simply immoral that essential public utilities that provide heating and light should be at the mercy of 'spivs and speculators'. The energy companies were stolen from us by thatcher and her minions so we should only pay back what the current owners paid for them and if they are not satisfied with that (and the billions they have raked in in the meantime) they should be prosecuted for receiving stolen property. We decided a few years ago to NOT give our money to the big 6. We now get our energy from ECOTRICITY 100% renewable energy. A moral decision which has seen our bills go down TWICE and our payments turned into the building of new renewable energy sites like solar and wind farm. Stop the big 6 profiteering by CHANGING YOUR PROVIDER to a company you can believe in, or, as the report suggests public ownership. As for the statement "The proposal is affordable and practical under existing EU law." Once we are out of the EU they have no say on how WE run our OWN energy! All the greedy people running the Big Six have become very wealthy, with outrageous bonuses paid at our expense! It's no wonder that they don't want to reduce their prices, when they are hugely rewarding for making record profits. They always have an excuse for not REDUCING their tariffs, when their costs decrease. So let's 'bin' them, and take control of what we used to own! (I am with Green Star, at the moment). I've just changed to a supplier of renewable energy - and it's cheaper. 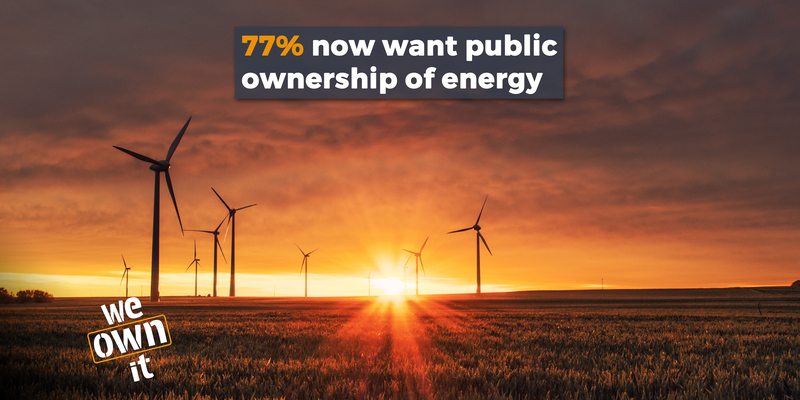 I support a return of the energy industry to public ownership. One sentence worries me, it refers to councils being "encouraged" to engage in renewable energy,, This is hand knitted planning ! Get real, yes it's all very nice wanting renewable energy, but do not for one minute think that this firm of energy could really cope today, let alone in 15/20 years when immigration has increased the energy customer pool by another 3 million !!! We are a small island surrounded by tidal seas but we don't seem to be investing in harnessing this energy to generate electricity, instead we seem to be going all out for fracking which will contribute to the burning of fossil fuels and have spent billions on wind an solar energy which isn't really efficient.